Chinese New Year this year was special to me. I get to know a wonderful group of friends on twitter. 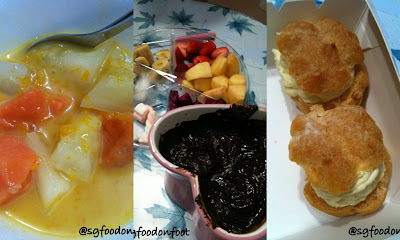 I was invited to a Chinese New Year gathering with my foodies and twitter friends at Susan's place. Like every tradition Chinese New Year dinner, we had Lo Hei (bought from Sakae Sushi). Hope it brings prosperity, luck and good health to everyone. Susan has prepared a lot of food for the group. For cooked food, we had Fried Beehon, Curry Chicken and Chilli Crab. They were all very yummy! A big thanks to the wonderful cooks in Susan's family for dishing out the wondering dinner. 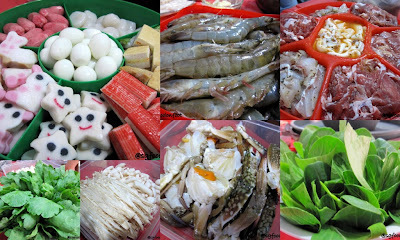 Besides the cooked food, the lovely host also prepared steamboat for us. We were presented with a great selection of fresh food for the steamboat. Dinner did not just stop here. We have desserts waiting for us. There were Bobo Cha Cha (prepared by Susan's mum), Chocolate Fondue and Durian Puff (brought from Durian King at Northpoint). One of our friends, Rae also brought some homemade ice-cream made by her aunt. She brought us 4 different delightful flavours (Durian, Milo, Ginger and Rum & Raisin). My favourite was the Durian. It was creamy and flavouring with the Durian aroma. If you would like to try out these homemade ice-cream, you can refer to their website HERE (http://www.jessdesserts.sg/). Lastly a very big THANK YOU to Susan for the great hospitality and to each and everyone that made the gathering possible. Thunderbolt Tea by Boon Lay Traditional Hakka Lui Cha – Authentic Healthy Thunder Tea Best for Weight Management!